It's amazing how much wild birds, mice and rats will take. I'm really trying to cramp down on it at the moment. Are you still getting the same number of eggs? I think I need to start measuring it out and working out what each bird eats. 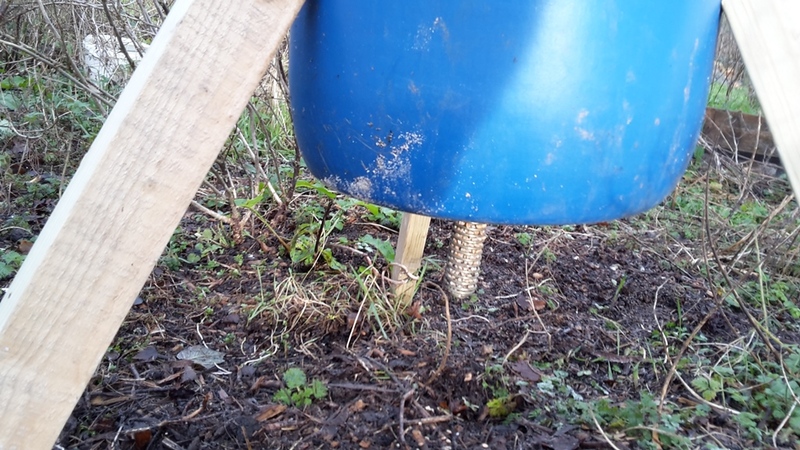 We have used the spring type feeder with success. We suspended it from the roof of our chookhouse. We had a lot of trouble with house sparrows and pigeons eating our grain, so we have tried different methods. Slowly but surely the pigeons have worked out how to work the treadle grrr! Yes I'd love soemthign like that but they work out quite expensive when you haev up to four pens of chickens. Maybe I could make one. Pigeons and air rifle make a good mix by the way! 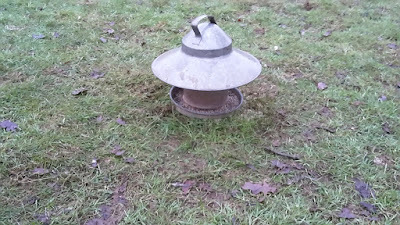 I use galvanized feeders. They are in the hen house. I don't think I have any critters helping themselves. My hen houses are more just coops for night time sleeping so wouldn't want them eating in there. I know I have certain issues with four legged friends as I can see the trails. I have poison down but it's not working at the moment. I've looked at making these but I don;t think the ply would hold up with how damp it is here unless I could make it from something else. Hand broadcast once a day, and everyone joins in. Usually as I leave their pen, two Ring Doves and about 20 Sparrows join the eating frenzy. We were losing a lot to the wildlife with the large base in place, so we changed it to the smaller one that comes with the feeder and problem solved. We are going through much less food now. 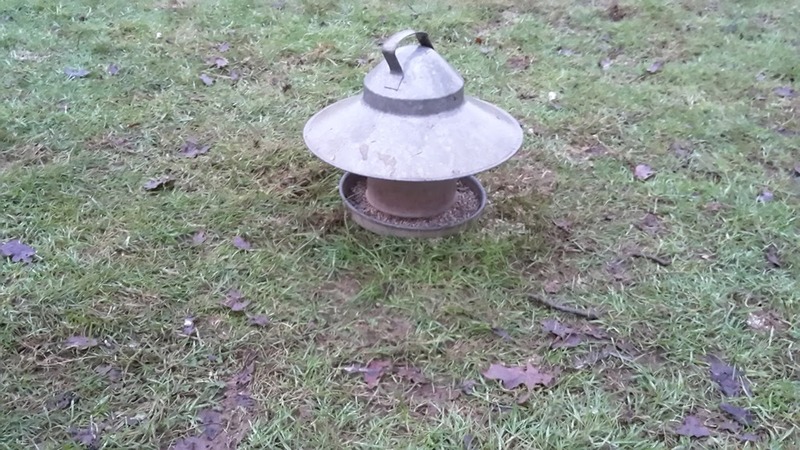 We don't mind the wildlife getting some of the food, the squirrels leave this feeder alone and tend to feed out of the dish in the Eglu which is left open for the chickens to use as a wet weather shelter. 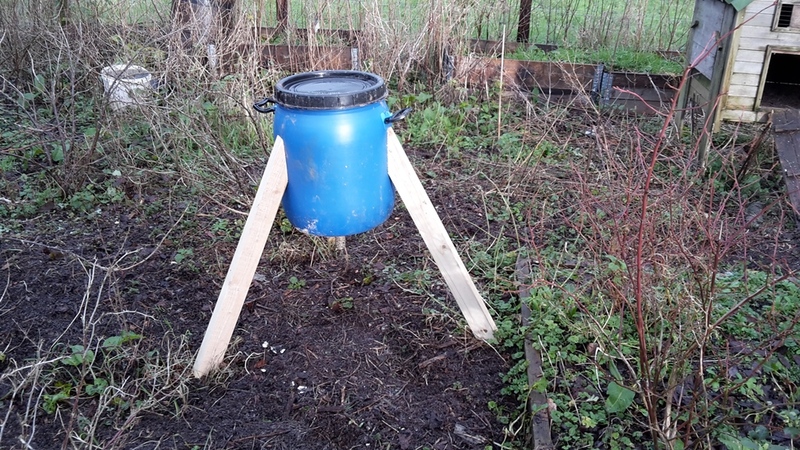 Our other pellet feeder is the same small galvanised one as yours it's easier for the bantams to feed from. We used to have a feeder IN the old henhouse but our birds have always preferred to feed outdoors and it would remain full for ages. Corn is scattered along with any trimmings from the polytunnel on the hardstanding in Chicken World once during the morning and is usually gone before any wildlife can join the picnic. Kev, I've just been away for a week so I missed all your news. Congratulations to both of you on the birth your baby son Alastair, very pleased and glad it went well for you both, if somewhat stressful. You seem like you've settled down to normal life again, hope you're not missing too much sleep. Well done Claire!